We're Awakening! : Pre-order Deluxe Edition of "Vice Verses" on iTunes NOW! Pre-order Deluxe Edition of "Vice Verses" on iTunes NOW! Hey soldiers. The time is getting nearer... it's all coming in clear! "Vice Verses" is now open for pre-orders on iTunes. This pre-order is really sweet; it will include the bonus track "Fading West," the live "Hello Hurricane" tracks, as well as a demo version of "Dark Horses" available EXCLUSIVELY on iTunes pre-order. The only way to get that one is to pre-order it now. 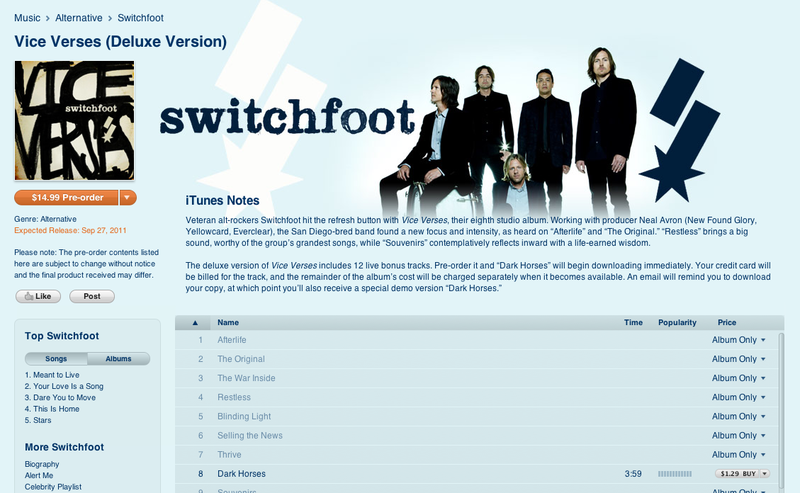 Once you pre-order, the "Dark Horses" single will download instantly. Be sure to get your copy and support the single! Let's get it up the charts. This is our first real test, foot soldiers! Jobbbb. When will the preorder be available on international iTunes? I'm going follow your blog.